The Mercer Culinary Hell's Tools high temperature spootensil's unique shape makes it ideal for a variety of uses in any kitchen. 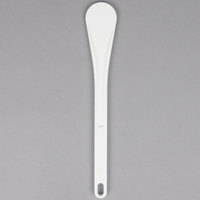 Use this white, 9 7/8" spootensil to mix, stir, or spread anything from sauces to batters! Made from specially formulated, glass-reinforced nylon, this spootensil is incredibly durable, stain and odor resistant and is also heat resistant up to 430 degrees Fahrenheit. Its one-piece construction makes it one of the most sanitary utensils available, and its indented handle provides a secure grip. Plus, the convenient hanging hole allows for quick access in the kitchen and easy storage! The plastic used for these is truly an incredible thing. They withstand heat, abuse, and most importantly they do not discolour over time. We regularly use these to mix our red sauces and they all still look white and new! These are an amazing product. My go to spoon. I use this for all sauce, soups, and mixing. I love how firm and strong it is, and how will it cleans since there are no grooves or seams. Is holding up great so far. The spoontensils have become one of our more used stirrers in the kitchen for sauces and the like. All sizes are great to have, for almost anu application. I couldn’t imagine making cake pops without this spoontensil! It is perfect for stirring in my chocolate melting pot—Other utensils have melted, but not this one. I love these for mixing up batches of risotto when working ala carte. They are high heat which is great because I tend to leave them in the pot over open flame. A few have turned color but none have melted. They are also good for action stations in a quiet dining room as they don't make too much noise in the pan. If I could change something, I would buy slightly bigger. This spoontensil is a good tool to have on hand as it is very sturdy. However, it stains very easily when it comes into contact with food coloring and it it a bit thick to reach into small places. What you see is what you get with this one. Works well to stir things that you are cooking. I like to use them on the stovetop. I use the Mercer Culinary Hell’s Tools nine and seven-eighth’s inch White High Temperature Spootensil on a regular basis. We recently started expanding our hot app recipes and this tool has been invaluable. And I always appreciate not having to worry if I left the spoon in a pan. Works well, great solid construction, not too heavy and easy to order. This spoon is smaller than I was expecting but the size is great for small pots and bowls. Sometimes I have to remind myself that this spoon can tolerate the high temperatures of the stovetop because it doesn't feel that much different than a regular white plastic spoon. But this can definitely withstand the heat. This spootensil is a great alternative to using wooden spoons that can harbor bacteria and discolor. Works great for mixing, and cooking since it is high temperature resistant. This is my go to sauce stirrer or spatula for stir fries. Admittedly it stains when cooking with spices such as curry and tumeric but it does not affect its performance. Neither does it absorb the curry flavours. I have a few of these spootensilsto go with each of my sauce pans and some spares which I give away to my friends. I use the bigger ones for stock pots. I love cooking with this high temperature spoontesil. Great quality and price and so easy to use for almost anything. You will love it and never go back to wooden one. As I was scrolling through the kitchen utensils, I came across this "spoontensil" unsure of what it actually was. This is such an awesome kitchen tool for high heat cooking. we love it! I like these spootensils they are great for mixing hot items. I use this when I make my caramel sauce from scratch. I will be ordering more of these soon. This is a great utensil for two reasons--Not only is it heat resistant, but it also won't scratch non-stick surfaces. I recommend this to anyone who has had problems with their plastic utensils melting during use. I ordered this Spootensil because I need it something that would work with high temperatures and i hit the jackpot . Excellent to scrape the food remains out. This is a multi use tool that easily fits in my utensil drawer. I really do like this spatula but it stains in high heat which is not cute to look at afterwards. I wish they came in other colors. But all in all it works for what I got it for. Slightly smaller than the 11 7/8 inch. I like having both sizes. Great for doing candying work, cleans off well, can use in high temperatures. Great to hang up in the kitchen! Exactly what I expected. Sturdy, durable, reliable, and at a great price. I'm going to take a look at the rest of my (non metallic) utensils and consider replacing them with similar high temp utensils. I'm delighted with my purchase. I ordered this because I need something that would withstand high temperatures and reach deep into pots to scrape the food remains out. This fits the bill and easily fits in my utensil drawer. The quality of this item is excellent I purchased the three different sizes of spoontensils I have found that the largest of the three is the one we use most. But all three are very well made. The perfect tool to reach deep inside small mouth jars and jugs. It gets every little bit of product out of a container maximizing profit. I wasn't so sure about this initially, it doesn't perform so much as what I need a spatula for, but in using it with high heat items on the stove, it really proves its worth. Not having to worry about it has been a relief in everything from making simple syrup to brittles. This is exactly what I was looking for when scraping our large Hobart dough bowl. The handle is long enough to protect your hands from the blade in the bowl and it doesn't get nicked too badly when coming into contact with the sharp blade. Highly recommended. Our staff really likes using these, too! I use this 'spoontensil' when working on my hobby of creating homemade lotions and things. It is stain/odor resistant so I don't have to worry about cross contamination with the essential oils and scents that I use. One word: guacamole. this utensil is absolutely perfect for guac or similar thick spreadable products where a sandwich spreader isn't quite right and neither is a spoon. This is the in-between and I'm loving it. Always looking for utensils that can stand the heat. They are so hard to find and eventually start losing their durability as well as their shape(then i worry about what I may be ingesting of their material make-up) Not this. This spoontensil is great. Love the long handle which allows me to cook safely. Clean up is easy and am very pleased. I love this spootensil! I use it with cookie dough, royal icing, and buttercream. It is super sturdy for use with my harder doughs, but also very sleek and easy to use with icing. It's very easy to clean and after a lot of use it has stayed pristine. I had originally bought these for when I make candles. They didn't absorb the color or the scent and I have been using them for cooking. Very handy and very sturdy. This is a cool little utensil. It's perfect for sauté. It doesn't scratch the pan and holds up to the heat. Will be buying more. Let's call it what it is: it's a stirrer. Its paddle is just enough to get a good stirring action, and is curved nicely to be used in sauciers. It is definitely not a spoon, and really cannot be used to serve what you've made in your saucier. This is the smallest size manufactured, and this limits its usefulness. It is very sturdy, doesn't stain easily (unless you're stirring tomato sauce), is dirt-cheap, and unlike wooden utensils, is dishwasher-safe and can be sanitized. This Mercer white high temperature spootensil is the best. This spoon is for non-stick pans won't starch the surface. The price is great, will buy again it needed. Spootensil is a great utensil in the stock pot or deep bowl. It holds up well to high temperatures and doesn't seem to stain, will buy more, thanks! I bought the Mercer 9 7/8" white high temperature spoontensil because of its stain and odor resistant properties. The quality is good, but it was smaller than I expected. The price can’t be beat for the quality provided though. I plan to order more of these spoons in different sizes soon. I bought this because I thought the name was cute. But it turns out it came in handy fitting in my little cups for baking. I can't wait to use it as a tool on a cake also.